So now that you have your whole aquarium set up, you’re missing one thing: the LED light that goes over the top of the tank. Don’t worry, we’ve got you covered with our aquarium LED lights buying guide! We’ve looked at a lot of lights, both submersible and not, to bring you our recommendations for the best! Before we get to the reviews, let’s look at some of the things you should know before you go. Brightness: This refers to how many watts the light will put out, and therefore how bright it will look. Higher wattage lights use more power but are brighter for fish, while lower wattage lights can sometimes be more comforting. Light Color: Usually, aquarium lights come in either blue or white light. Occasionally they come in multiple colors that all shine into your aquarium at once. Some light sources are better for plant growth and others are just for fun! Submersible: Some lights can actually be mounted inside the water without causing any sort of electrical problem. These are rare and more expensive, but they are really convenient if that’s what you’re looking for. We’ve included some for variety. Remote: There are a few aquarium lights that come with a remote to change the light settings. This is really useful so you don’t have to take the hood off to change the light or turn it on or off. Size: This is how big the light is. This is important so that you know if it’s going to fit on your tank or not. A light that is too small won’t stretch and one that is too large is unnecessary. Warranty: If your light is defective on arrival or stops working within the allotted warranty time, it’s protected by the warranty. If it’s the company’s fault, they will replace the device at no cost, or refund your money. So you know what you’re looking at; now we just need to get to the aquarium LED lighting reviews. We’ve looked at a variety of the best lights on the market right now, and we’ve come up with this list. Take a look at our top and budget picks first. That’s the best of the best! The rest of our list features unique and useful lights that would be perfect for your aquarium as well! Let’s get started! 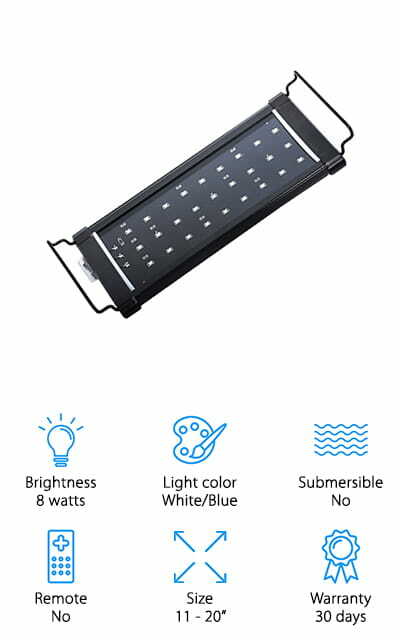 The Koval Inc Aquarium Lighting module has 156 LEDs in the panel, all of which are full-spectrum. There are 5 different colors in the panel, all of which work together to make cool blue colors and bright, daylight whites. There are three modes you can set it to – all LEDs on, only Blues, and off. Though it’s meant for aquariums that are between 45 and 50 inches wide, there’s an extendable bracket so it fits aquariums that are larger. These LEDs have a lifetime of about 50,000 hours of on-time, so you’ll be able to enjoy these lights for a long time to come! The best part? They are each independently operated, so if one goes out, you will still have the entire panel of LEDs to work with. It’s a highly-efficient and won’t use very much energy to make your fish happy! The light also helps your real aquarium plants and coral grow beautifully large! The NICREW LED Light is great aquarium lighting on a budget! They’re energy efficient and super bright, which will make your aquarium shimmer like the real ocean. The extending brackets make this light useable in aquariums that are up to 19 inches long. There are two modes you can set it to, a blue LED mode for a fish nightlight, or white and blues together for daylight simulation in your tank. It is recommended that you place the light over a glass or plastic canopy, so there is no chance that water can get onto the lights and burn the unit out. This cheap aquarium LED lighting is very simple and gives you the basics that you need to keep fish happy and healthy. This light works for both freshwater and saltwater tanks and has a one-year warranty to protect you against manufacturing defects. If you’re just getting started in keeping fish, this is the perfect light! The Mingdak Light is the first submersible light on our list. It puts out incredibly 12 volts, so it’s brighter than a lot of other lights on the market right now. You can use it for night viewing, as it’s a great light that works to illuminate your aquarium with cool white light. Your reef will shimmer like it’s really under the ocean! It’s got in-frame mounting, so you won’t see the fixture when it’s set up correctly. 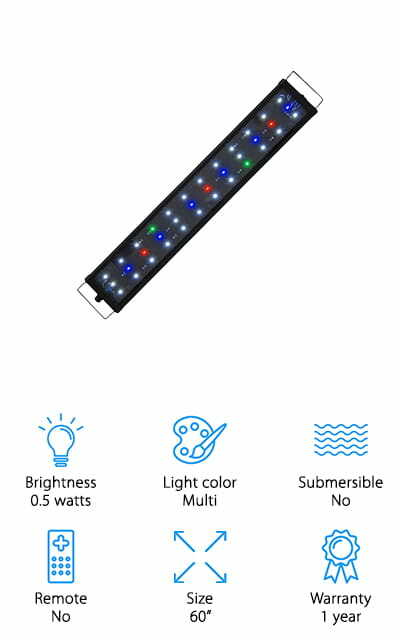 This light bar even comes with suction cups so you can use it wherever you choose within your aquarium. The case is extremely water resistant, so you won’t have to worry about electrical problems. The LED lights are 20% brighter than fluorescent or other light options, and will last a really long time! Give your plants and fish the lighting they need with this planted aquarium LED lighting! We love the variety of uses for this light! 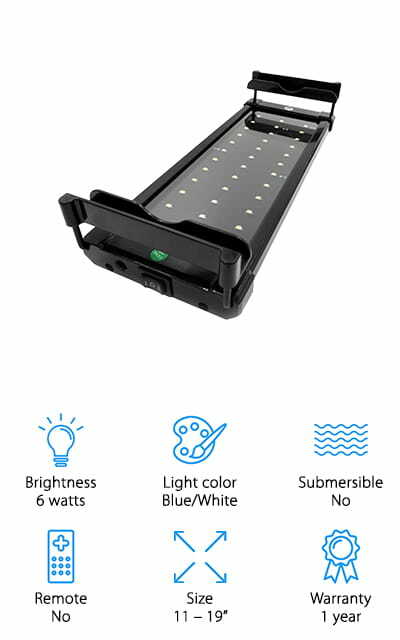 Beamswork makes one of the top aquarium LED lights with this piece, which puts out 3,000 lumens. You won’t ever have to replace the bulbs in this light fixture! It is energy efficient and sleek. You will love having it in your aquarium, and your fish will too! You can use a timer with it, and there are 2 modes that you can set it to, including a day mode for sparkling underwater scenes and a night mode to provide a nightlight and ocean-true moonlight. There are extendable brackets included that allows the fixture to adjust to different lengths, so it’s sure to fit your larger-than-average aquarium. You can buy the specific timer that the lights are wired for separately. It is compatible with both 110-volt and 220-volt power sources, which is normal household power outlets. 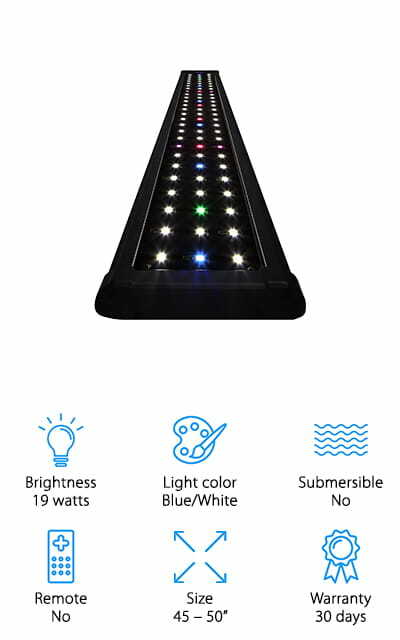 There are 66 LED lights in this light bar, which will help your plants grow and your freshwater fish prosper! 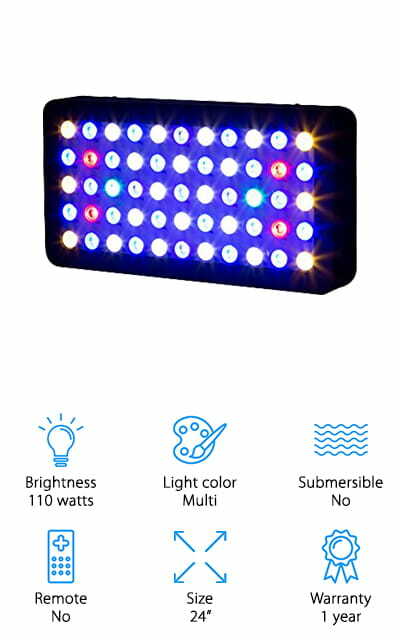 The COODIA Aquarium LED light comes with multiple color LEDs on the panel, which will help your aquarium plants to go to their full potential. There are multiple lighting modes to target plant growth, making this the best reef aquarium LED lighting on our list. It’ll even help coral flourish! It fits tanks between 28 inches and 36 inches in length, with the included extendable brackets. It works well for freshwater and saltwater, you only need to put it on the top of the fish tank. Want to know our favorite part? It comes with a remote! You don’t have to point it straight at the receiver, so you can control it from across the room or the next room over if you’d like. The remote even has a dimmable feature! It’s super easy to use. The housing around the light is aluminum, so it vents heat extremely well. This light won’t overheat very easily. We love the simplicity! Vipar Spectra LED Tank Light is one of the best aquarium lights for sale right now. It’s got a timer, so you can control when the light is on and what time it turns off. It’s a full-spectrum light that is suitable for all types of reef and coral that are photosensitive. This light is extremely high quality, so much so that it has two brightness channels that you can adjust independently with a dimmer. There are fans and heat sinks in the case for heat dissipation to help keep your fish and your equipment safe. It comes with a remote to keep these two brightness channels and all other settings adjustable from across the room. It even comes with hanging kits so you can find the perfect place to put the light and have the means to put it there! This light is absolutely phenomenal, and all of the features make it absolutely stand out on our list. Hipargero’s LED Aquarium Light is simply amazing. It’s got a full panel of 3-watt LED lights in dark blue, regular blue, and white. They have proper ratios of these lights so you can perfectly mimic sea-like environments. It also helps to bring out the color in your coral. The lens that the LEDs shine through is an acrylic lens that helps them shine and produce amazingly accurate, clear color. There are two channels that you can dim, all through touch control. Different fish or plants need different light intensities, so this is perfect for finding the balance that you need. The brackets that are used to attach this light are heavy-duty metal, with temperature control fans that work silently to keep the heat vented. Your fish will love their new comfortable environment. This light is extremely thin, and we love the touch-sensitive intensity settings. It’s plug-and-play and super easy to operate. We love it! This LIghtimetunnel Fish Tank Light makes for great aquarium lighting. For the money that you spend, you’re getting amazing quality that can’t be beaten! 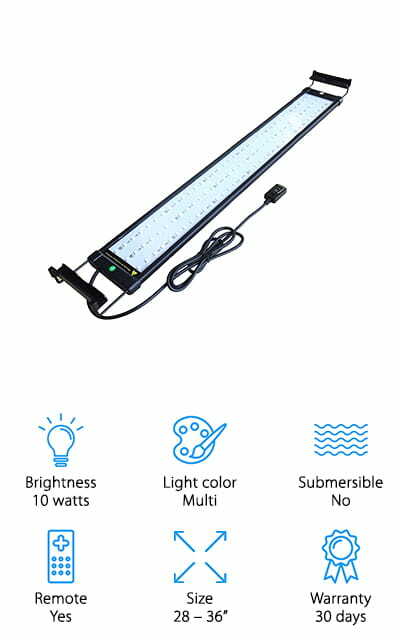 It’s got super high brightness (at an incredible 110 watts), which means that the light penetrates deep into the water to give your fish and plants the light they expect from the ocean. The 120 LED lights are covered with an acrylic lens, which helps the color feel vibrant and amazing. Get high resolution without wasting a ton of energy! The light spectrum helps reefs, coral, and plants grow and thrive in a healthy environment. There are two light setting channels that can be independently dimmed. One is a daylight lighting setting and the other simulates moonlight perfectly. 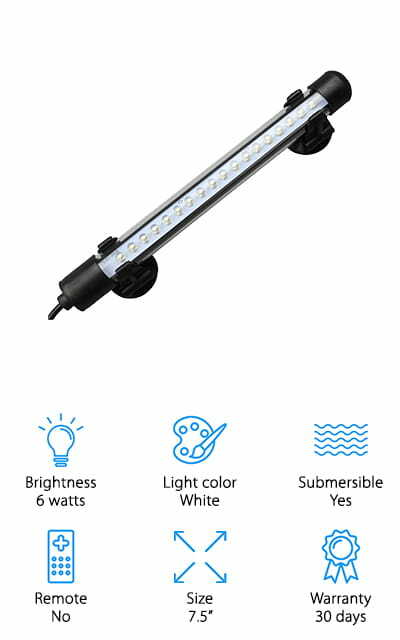 It’s suitable for both fresh and saltwater aquariums, so no matter what type of fish or environment you have, this is the light that you’re going to want! Our favorite part about this light is the touch-dimmer! 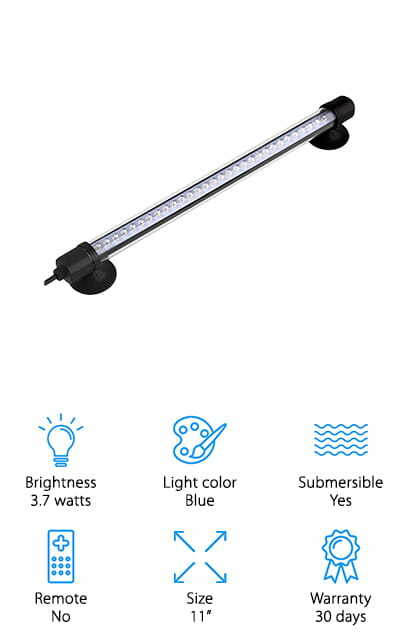 The Amzdeal LED Aquarium light is another one that is waterproof and completely submersible. It’s great to see that this is an option for tank lights! This light can be completely submerged in the water without worrying about being shocked. It comes with 10 blue LED lights, which creates an ocean-type living environment for your fish. There are two suction cups on the bottom of the light so that you can attach it to the tank and use it inside the water. You can even put it on the bottom of your fish tank, or anywhere else that you want in order to get the perfect lighting that you and your fish both need! 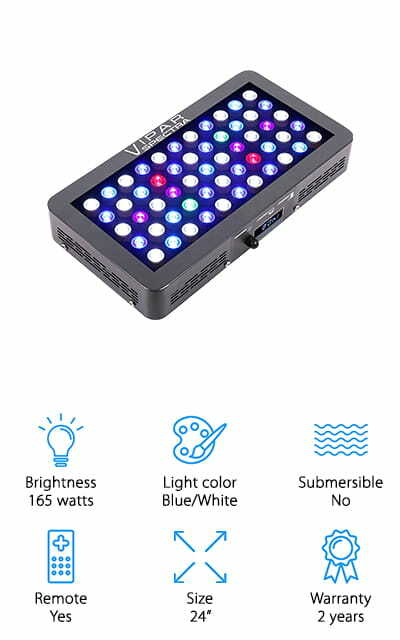 The wide variety of applications really makes this light shine – you can use it in pet cages, as well as rockeries and cisterns, so it’s not just a set of aquarium lights. We love this super-bright LED bar, and we’re sure that you will too! 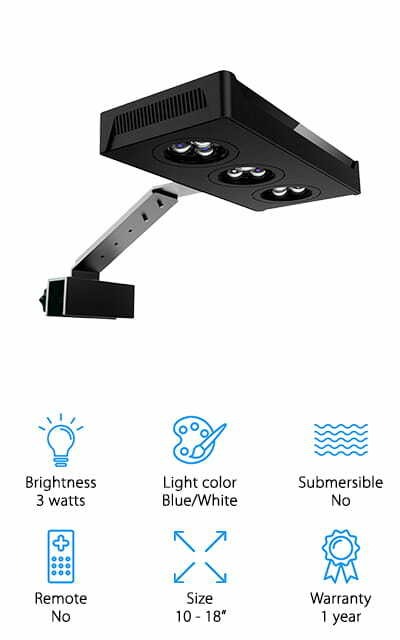 The KZKR LED light is a cheap aquarium light that comes with a list of super simple features in order to bring you the best value for your money. There are two modes – daylight mode, and moonlight mode, in order to give your fish the best possible simulation of the ocean life. The extendable brackets make the light up to 9 inches longer than it normally would, which is pretty amazing. There are 29 bright white LEDs on the panel, and 3 blue lights to give your water that amazing ocean shimmer that your fish are sure to love. Healthy fish believe that they are still at home – so whether you have a freshwater or saltwater aquarium, your fish will benefit from a light that makes them believe they are in the ocean. The hood should be placed on the hood of the aquarium, where the light can shine down through glass or plastic to achieve the best results.